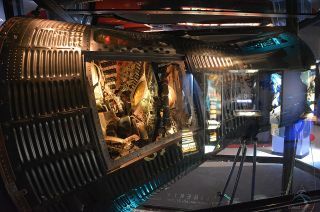 The Mercury space capsule Liberty Bell 7, seen here on display at the Kansas Cosmosphere, will ship overseas for a four-month art and science exhibition in Bonn, Germany. A historic American spacecraft that spent decades sunken under the ocean will soon ship overseas for an exhibition that explores the "space between art and science." Liberty Bell 7, the NASA Mercury capsule that Virgil "Gus" Grissom launched onboard in 1961 to become the second U.S. astronaut to fly in space, will travel this summer from its home at the Kansas Cosmosphere and Space Center in Hutchinson, Kansas to the Art and Exhibition Hall of the Federal Republic of Germany in Bonn. Through the 12-part exhibition, "Outer Space" looks at the intense exchange between culture and science by drawing a connection between space artifacts, scientific displays, and science fiction to both historical and modern works of art. "While it is not a traditional piece of art by any stretch, the curators felt that Liberty Bell 7 had a unique story and was a compelling artifact," Jim Remar, Cosmosphere president and chief operating officer, told collectSPACE.com. Fifteen minutes after lifting off on a sub-orbital spaceflight on July 21, 1961, the Liberty Bell 7 splashed down in the Atlantic Ocean and proceeded to sink to the seafloor as a result of its crew hatch prematurely jettisoning. Though its pilot, Grissom, was recovered that day, it took another 38 years before a private expedition led by the Cosmosphere and Discovery Channel raised the capsule in 1999. Following an extensive restoration by the Cosmosphere's SpaceWorks division, "The Lost Spacecraft" embarked on a six-year nationwide tour before returning to Kansas, where it has since been on display at the Cosmosphere. The Cosmosphere has scheduled its own special farewell exhibit for the spacecraft, beginning on May 10. "A New Flight Path for Liberty Bell 7" will feature artifacts recovered from inside the spacecraft during the restoration process. The exhibit will give visitors to the Cosmosphere a glimpse into the personal side of Grissom's memorable mission by sharing some of the memorabilia and personal equipment he carried aboard Liberty Bell 7. Dimes, dollar bills, soap, and matches were discovered in the spacecraft after it was recovered from the ocean floor. Prior to it departing for Germany in August, Liberty Bell 7 will be moved back to the workshop where it was originally restored to be prepared for the two to three week journey. The 2,000-lb. (900-kg, with its glass case) capsule will ship by ocean freighter. Although it will cross the Atlantic, the Liberty Bell 7 is not expected to revisit the part of the ocean where it splashed down from space or was recovered decades later. Liberty Bell 7 will not be the first U.S. spacecraft to land in Europe. The Apollo 13 command module, "Odyssey," was displayed in Paris before being restored and displayed by the Kansas Cosmosphere. "Charlie Brown," the Apollo 10 command module, is on exhibit at the Science Museum in London. In addition to Liberty Bell 7, the "Outer Space: The Space Between Art and Science" exhibition will include two other artifacts from the Cosmosphere's collection. The Kansas museum is loaning the flight couch that held Enos, the first chimpanzee to orbit the Earth, on NASA's Mercury-Atlas 5 mission in November 1961. The Cosmosphere is also sharing the prop carbon-dioxide air scrubber that it created for a pivotal scene in the 1995 movie, "Apollo 13." The lithium hydroxide (LiOH) canister is a duplicate for a real space artifact the museum has its in collection. The couch, canister and capsule will return to the Kansas Cosmosphere when the exhibit ends in October. "Part of the Cosmosphere's mission involves sharing the wonders of the universe with the world, and as we prepare to send Liberty Bell to Germany, we know that her journey will serve to honor the rich history of the space program and inspire the next generation," said Richard Hollowell, Cosmosphere chief executive officer. "We're honored and excited to be sharing such an important artifact with space enthusiasts overseas." Click through to collectSPACE to see more photographs of Liberty Bell 7 at the Kansas Cosmosphere and Space Center.